It's 9 o'clock on a Wednesday morning in April. The sun is bright as polished chrome and the wind comes in hair-raising gusts from the northwest. 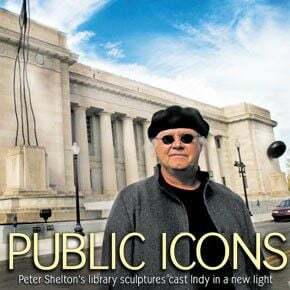 I'm hurrying up Pennsylvania Street to see the installation of Peter Shelton's two-part sculpture called thinmanlittlebird on the front of the Indianapolis-Marion County Public Library's Central branch. Shelton grew up in Troy, Ohio, but he's lived most of his adult life in the Venice section of Los Angeles, a place known for its rollerblading beach people and body builders. On this day, Shelton is dressed in a black wool coat to block the wind and backward slouch cap he jokingly calls "an Italian hard hat." A sense of humor is part of a successful public artist's tool kit. It's an effective way to keep the team of construction workers, engineers and assorted others with an interest in this project focused through what will be a long day -- from Bret Waller, former head of the Indianapolis Museum of Art and chair of the committee that unanimously recommended Shelton's proposal, to Ann and Chris Stack, the arts advocates and patrons who contributed the necessary funds to the Library Foundation to make this $750,000 project possible, to the members of the foundation and the IMCPL staff who are eagerly awaiting the culmination of what, for them, has been a six-year process during which the Central Library added a major new contemporary wing designed by architect Evans Woollen. Shelton addresses everyone by name. He can switch gears from speaking thoughtfully and at length about the art/historical context of thinmanlittlebird to a discussion of the finer points of bracing for wind and earthquakes without missing a beat. Then he gets back to joking: "You guys are supposed to smile when you're messin' with your nuts," he tells the workers as they loosen wingnuts securing the steel-reinforced bronze sculptures to the trailers that carried them here from a foundry in Oregon. When I round the corner by the library's eastern wing at Pennsylvania and St. Clair, I almost bump into Ann Stack. She's got a smile on her face that's bright as a freshly burned CD and she's so excited, she tells me, she doesn't want to talk. "I want this to be Peter's day," she says as she strides toward Veteran's Mall for a better view. A crane is lifting "littlebird," an approximately 3,500-pound torus with, as its name indicates, a little sparrow-like bird perched upon it, to its canted beam above one of the two pedestals the library's original architect, Paul Cret, placed on either side of the entrance in 1917. Cret said the pedestals were intended to support a pair of sculptures. But money to commission these works never materialized. The pedestals remained vacant and, over time, became almost invisible. Bret Waller, the Indianapolis Museum of Art's director emeritus, is another one who can't keep from smiling. His committee solicited proposals from artists around the world and narrowed that search to four before unanimously selecting Shelton's design to recommend to the Library Foundation, which, in turn, had to get the approval of the IMCPL board. "It took 92 years before Chris and Ann Stack came along," says Waller of the patrons who are finally helping to realize Paul Cret's intention. "So this building has actually been naked for 92 years. If you look at it you can see that it's unfinished. In fact, there was a quote from a story that ran in The Star at the time by a writer who said he hoped the people would not come to view the building as finished until the two great pedestals were filled." Chris Stack was introduced to Peter Shelton's work via an installation Shelton brought to Indianapolis called floatinghouseDEADMAN in the early '90s. "I thought it was terrifically clever and aesthetic. Totally impractical but beautiful," Stack says. "'Deadman' is a construction term for a counterweight and this was in the shape of a dead man -- a big, cast-iron piece sunk down into the concrete and it was perfectly balanced to lift this house off the ground. It was floating. I thought it was terrific and I've never forgotten it. As soon as Ann told me Peter Shelton was being considered, I thought, 'He'll do something really cool.' And he did!" But installing thinmanlittlebird was not without its own, site-specific challenges. "When Peter came out [to Indianapolis], he said, 'OK, we'll just tie it to the steel in the library," Waller recalls. "But there is no steel in the library. It's entirely masonry. Limestone exterior and hollow clay, tile and brick on the interior. There's no steel at all. So Peter worked with engineers to figure out how to drop a steel shaft all the way down from the roof, down into the earth to anchor it." "We had to try and model the loading from both wind and seismic earthquake standpoints," says John Greenheck of KPFF Engineers, a Los Angeles-based firm. Greenheck, looking chilly in the wind, is standing with his Indianapolis counterpart, Al Kovacs of Arsee Engineers in Fishers. "The wind design is for 90 mph three-second gusts. And we looked at ground excitations." "Initially, they just wanted to put something up against the limestone," says Kovacs, referring to "littlebird." "But we saw that it was too heavy and too far out. So we came up with a frame, like an H that's behind that thing, with columns running from the foundation to the roof." "You have one chance to do it right and no chances to do it wrong," Greenheck adds. "We do the best we can and try to make sure it's safe." "Creating the retrofit to support [thinmanlittlebird] was an engineering and a constructor's success story," says Mike Coghlan, the library's capital projects manager. "The steelworkers and the finishers really did a spectacular job." As "littlebird" is being locked in place above the library's eastern pedestal, Shelton is reflecting on how this work has evolved. "I thought we'll make this big surface and it's sort of pristine, which is a little bit of the idea -- the platonic form of the torus, rather than the classical cube or sphere or pyramid. "I also thought, 'Well, this thing is going to get a bird on it in a minute and mess it, right?' So I thought I'll just preempt that and put my own bird on it. "But I like the scale change of it. It has a little of that astronomical scale to it, as if you're looking at a galaxy or a model of the universe, which the library itself is, so I like that relationship. The bird is a little metaphor for our delicacy on the edge of that universe." As to how it felt, as a contemporary artist, to bring an early 21st century perspective to an early 20th century building, Shelton says, "It was very intimidating. I hadn't really made bronze sculptures on pedestals before. It was an interesting problem to come up with something that extended the traditional, that was respectful of this Beaux Arts tradition, but, at the same time, pulled it into some contemporary frame. That was a challenge -- to push it out there a little bit and, at the same time, have some sincere affection and respect for the history." It only takes about 45 minutes to fix "littlebird" to the steel beam that thrusts from the library's limestone wall. Once this portion of the job is done, Shelton and all the members of the construction crew, including the engineers and the library's Mike Coghlan, assemble for a team portrait beneath the torus. As she looks on, Ann Stack tells me she wants to send copies of this shot to state legislators and local politicians who tend to question the economic importance of the arts. The image of these guys in hardhats ought to give the policymakers an idea of all the people and varieties of high-level expertise a single arts project like this one can put to work. It's 12:50 and the wind is really whipping. Dark clouds have been gathering in the northern sky for the past hour. Where "littlebird" went up with relative ease, mounting the over 30-foot-tall "thinman" on its western pedestal is proving to be a dicier proposition. Unlike "littlebird," "thinman" is long and sinuous and meant to be bolted directly to its pedestal. "If you take the cap off the pedestal," Shelton says, "it reveals a chimney that goes almost 30 feet down through the substructure of the building. We introduced a big truss work that went down inside of that." Like "littlebird," "thinman" is essentially independent of the brittle and rigid masonry library building. "The pieces had to deal with this issue of not being trapped by the pedestals, and finding some way to respect the pedestals but not just surrender to them," Waller says. "'thinman' will be leaning out slightly and up above the top of the building. So both [sculptures] are looking to assert their own being, their own reality. The building already looks better. They bring it alive. Paul Cret knew what he was doing. He knew he needed a punch there. I think we all got used to the empty pedestals. We thought that was the way it was supposed to be. But when you see what happens with something related to the pedestals ... they're like stages waiting for almost a century for the actors." As he watches the construction crew lift "thinman" from a horizontal to a vertical position in the middle of St. Clair Street, Shelton says, "A theme in my work has been working with light and heavy. I think sculpture in general can be interested in how you represent or convey a sense of aliveness in what is essentially an inert material. "I think I had this idea that both pieces are meditations on the figure. The very tall figure I thought of as being a bit like a vine that would rise up out of and work against the plumbness and rectilinearity of the building. It was more gestural than a body. "It's about 7 feet taller than the parapet, so it's sort of pulled up out of the building and the building is so substantial that all these can really do is make a little gesture. "It's also a little bit of a play on how, in the Greek Revival, which you have out of Hellenism, there is this perfection of the body that is very rationally, reasonably, idealistically proportioned. I wanted to work with something that had more of a contemporary feel; I don't know if we have the same confidence about our physicality. In our post-industrial life, we have problems with our knees, or some other part, and just get it fixed like we're a car. There's less of that sense of unity between body and spirit that I think was certainly part of the classical ideal." "thinman" is enclosed by a steel cage that will have to be removed in sections by a crane. But as the crane lifts the uppermost section, a violent gust of wind shakes the elevated bucket in which two workers are standing, and sets the cage section swaying. It hits "thinman's" shoulder, leaving a telltale scar. Shelton dons a hardhat and is strapped into a safety harness, ready go up in the cherry picker with a hastily mixed brew of sealant and a blowtorch to repair the damage. Later, he confides that the combination of wind gusts, racing clouds and the height above the street made him "want to hurl." But as he daubs at the wounded bronze with a painter's brush, he can't resist looking down at the apprehensive onlookers below, throwing a goofy grin and exclaiming, "Look! I'm an artist!" Chris Stack shakes his head in admiration and offers what amounts to a definition of what makes a successful public artist. "He's a renaissance guy. He knows a lot about a lot of things. He's easy to talk to. He's got a great sense of humor. He's not out there on some other planet." Now we wait. It turns out the process of removing the rest of "thinman's" cage, as well as the large sheets of plywood that have been bolted on to it for extra bracing, is painstaking. And the wind continues to play havoc with the day's timetable. At 3:30 a construction worker walks by and mutters, "I bet you're about ready for this to be over. I know I am." Even Shelton seems to be feeling the gravity of a day spent standing on concrete. He seems to be getting a little bit slower as the day wears on. The delay allows plenty of time for passersby to have a look at the library's new arrivals. "I don't know about other folks, but I think it's interesting," says a traffic cop who's blocking the street. "Somebody's going to go by here some night, three sheets to the wind, and go, 'Ah! It's an alien being!'" Somebody else looks at "thinman" and says, "It could be in a Stephen King movie. That guy gets up and walks around Indianapolis." This feedback is a good beginning as far as the Library Foundation's Emily Berger is concerned. "For the longest time, the library has known that we needed to finish the building," she says. "The decision to do something contemporary was a reflection of when Evans Woollen was designing the building. It was a way to add that perfect finishing touch to the entire project. I absolutely love it! To see people stopping on the street as we're installing the pieces here, and getting their take on it -- people are asking questions about it, and I think that's what art should do. It's the purpose of public art. It's getting people to take a moment to stop and reflect on the nature of art. I'm glad that the library can be part of that process within the city." The crane's motor hisses. One, then another of us, takes an aching seat on the curb. The sense of time passing feels a little like watching a baseball game -- nothing happens for long periods and then, in a moment, everything changes. Although nothing's happening right now, no one wants to leave without seeing "thinman" finally mounted on his pedestal. This happens without incident at 4:50. Workers begin the process of bolting that 2,300-pound big boy down. They'll be at it for another two and a half hours. During a break I ask a veteran member of the crew, Tom Whipps, what he thinks of all this. "You have to have a mindset to do something like this," he says. "It's pretty unique. I'm going to bring my grandbabies down here and tell 'em, 'This is what Poppy did.' And I'll ask them to tell me what this is and let them give their own interpretations."